Without a doubt, I think Marvels is one of the best titles to come out of the ’90’s. Sure, it was the time of Image and Valiant, of Marvel and DC making the change in their own formats from stuff for kids to a more teenage and adult approach, but with Marvels, it was different. I think this is one of the first stories, during that time, to not read like a comic book. 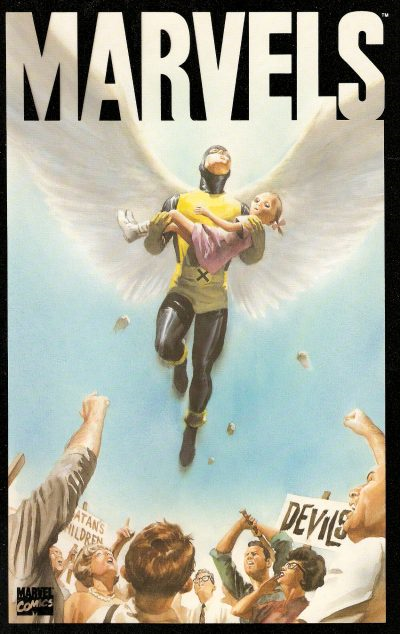 With Kurt Busiek’s writing and Alex Ross’ artwork, it swiftly became a visual and literal masterpiece. Told in four parts, over the evolution of what we know as the Marvel Universe, we see everything through the eyes of Phil Sheldon, a freelance photographer in New York City. In Marvels’ first issue, we looked through Phil’s eyes as we saw the rise of the Sub-Mariner, the immergance of the first Human Torch, and the symbol of freedom in Captain America. Now, it’s 20 years later, as we get to witness, along with Phil, the boom of super-powered people, and the rise of the mutants. Let’s dive right into this as we review Marvels #2. Phil Sheldon is in the offices of the Daily Globe, one of many newspapers in New York City, and man is it a time to be alive. “Costumed maniacs are ripping up downtown!” Sheldon’s editor yells into the newsroom. Everyone scrambles. This has become a sort of normalcy now. Spider-Man fighting along the rooftops of the city. The Fantastic Four, the Avengers, and the return of Captain America. It was life or death. The Grand Opera… the greatest show on earth, and Phil was capturing it all. Beneath all of this wonder though, beneath the “Marvels”, as Phil had dubbed them, lie something dark, something almost evil. Mutants. Kurt Busiek’s script is one of the best I’ve ever read in a series. Each issue takes place in a different, but substantial part of the Marvel Universe’s evolution. In the beginning, we saw the initial spark. Now, we’re right in the middle of it, with the mutant problem, and especially the X-Men nagging at us in the background. It’s the ’60’s, with civil rights, and a massive tension that is effectively shown in everyone. Busiek captures the feel of the times with his words and layouts. The characters are rich with life, and even the people that only show up for one panel feel real. It’s a story, and it’s told extremely well. We go with Phil as he moves from the inside of the city, taking pictures for his future book, staring in wonder at the Marvels, watching the likes of Iron Man, Thor, and Captain America battling to save the lives of the innocent. We also feel that tension though, as he goes to his home in the suburbs, and the “mutant problem” creeps at him from behind. They’re the next step, after all, and humans are obsolete. Mutants aren’t like the Marvels. No, they’re different. They’re killers, and all they want is to push us in the grave faster and kick that dirt on top of us. Kurt Busiek brings this all to life in such a beautifully crafted story. Alex Ross is one of my favorite artists. He’s very unique, and you can always tell his work from any other artist. His work here is breath-taking. The cover alone speaks volumes about the tone of the issue, but the pictures inside are unlike most you’ll see. Alex’s art style was fairly new to the comics scene at this time, or at least I had never seen anything of his until this. To wonder how he makes it all so life-like, how it all fits so perfectly on the pages, how he is able to capture that awe, terror, and wonder in each of those panels. I know how he does it, but that’s not the point. The point is, Alex Ross is an amazing artist who’s talents are above and beyond most others that have worked, or are working today. From close-up to establishing shot, you are entranced by the visuals in this book. I think the thing that I like best about this is that it portrays the Marvel Universe in a very realistic light. In everything else, it’s very fantastic and outrageous, filled with sci-fi tech and gadgets and outer-space adventures and whatever else can be put into a page, but here, it’s unique. It’s down to earth. It’s on my level. I see, like everyone else in the pages of Marvels, these fantastic characters for only glimpses, but it’s enough. I sit there and I wonder, and imagine, as I assume most of the others do, about just how awesome it would be to catch a glimpse of one of them. Wait! There’s the Fantastic Four signal alert! I wonder what’s going on? It brings a smile to my face every time. If you’ve never read this, I highly recommend it. Sit down, and get comfortable. It’s a nice ride, but be sure to hold on, as some of it gets a little bumpy. With Phil Sheldon as our guide, we get to witness the birth, and growth, of one of the greatest comic universes ever created. Kurt Busiek’s words, and Alex Ross’ visuals, help very much to bring this to life, and what a life it is. Parental Concern: None. I’d be concerned if you didn’t let your kids read this! Top notch mini series. Did you ever read the conspiracy series that came after this?